Looking for an outdoor security camera system, and get lost in the thousands of systems and hundreds of different brands out there? Plan to upgrade your old outdoor security camera system and ready for some latest technology to protect your home from break-ins, vehicle vandalism, or burglary again? 4-8 HD cameras, best quality images, notifications to phone, visible during night, accessible from mobile device, easy installation, weatherproof… You want them all, but is there any outdoor security system qualified? And you definitely don’t want to break your bank for this outdoor security camera system. No worries. That’s exactly what I’m going to cover in this post: How to choose the best (yet affordable) outdoor CCTV camera system among the thousand options out there quickly and easily. Note: The outdoor security camera system I’m talking about here is the one for self-monitoring via phone/PC with ZERO installation fees, instead of the alarm systems requiring monthly fees for third-party monitoring or expensive installation from the security company. So what’s the best outdoor security camera system in 2018? If you don’t want to dig further into all ins and outs about the outdoor security camera system, and want a real quick answer, maybe you can trust the thousands of users worldwide and the professional reviewers like the Vueville and Network Camera Tech. And here are two of the best-selling outdoor security camera systems in 2018 by far, based on real user experience with the most useful and demanding features for outdoor CCTV systems. If you prefer a wired solution of outdoor security camera system for home, and don’t want to have many cables running through the house, then this single cable indoor and outdoor CCTV system is right for you. 4MP/5MP class-leading resolution sees the human face and plate number clearly in distance. IP66 waterproof housing protects it from rainstorms, snowstorms, heat, and cold. PoE technology enables a single cable for both power and data. Easy to use & install. Email & push notifications to your phone so you will not miss anything. 100ft IR night vision, so you can see details clearly even when human eyes can’t tell. Remote accessible via free software on the mobile phone, PC, laptop and web browser. Upgradable. This 4 camera outdoor security system can have 8 cameras at most. Featured in top-tier media including TechHive, SecurityBros, NetworkCamera.Reviews, this 8 camera PoE security camera is recommended as “a surprisingly good CCTV kit for the money”, “an affordable & comprehensive security solution to save headache on installation”. Have you ever thought of a wire-free outdoor security camera system? Actually the wire-free outdoor security camera system has been gaining a lot of attention recently, due to its no-brainer setup (in minutes literally) and the highly portable feature. Operating on batteries, the wire-free outdoor security camera system will only record when there are movements around so it only records the thing that matters, and in that way, the battery could last longer (up to 6 months standby) and the SD card could save more days of recordings. And this type of outdoor wireless security camera system usually has mini stylish look, like the Reolink Argus 2, so you can easily hide it indoors and outdoors with some simple tricks. Want an Outdoor WiFi Security Camera System? You can easily set up an outdoor wireless security camera system with Reolink NVR and wireless security cameras, offering you a flexible DIY solution to match your various security needs with the right type of WiFi security cameras, like the bullet cameras, dome cameras, and the PTZ ones. 4MP or 5MP cameras at your choice, bandwidth friendly. Mix and match dome, bullet and PTZ cameras to suit your different monitoring needs. Plug and play installation, anyone can install the whole outdoor WiFi security camera system easily. Real time motion alerts with picture or video directed to your phone. Remote viewing enabled, so you can access it directly from mobile devices. So how to pick out a quality outdoor security camera system? Basically, 8 things. Note the below checklist to get the best outdoor security camera system. Generally, if you want your exterior security camera system to recognize faces and plate number, the 1080p resolution could well handle that in about 40 feet range. And that’s what most wire-free outdoor security camera systems offer these days. However, if the monitoring area is beyond that range or you just want clearer view with more details like the objects across the street, the 4MP and 5MP outdoor security cameras like Reolink RLC-410 will do a better job. And if you want to go to extremes on details, choose the outdoor CCTV system with optical zoom. In that way, you can zoom in to see all details captured without losing the image quality. In that case, go for an outdoor IP security camera system with push notifications. By this I mean, whenever the camera captures motion events like the strangers sneaking around your home, you will receive a push notification immediately on your phone, so you’ll not miss anything. Some quality outdoor security camera systems from top security camera brands feature other rich alerts additionally, including the email alerts which contain photos and 30-second video clips inside. Of course, that could be easily realized by most outdoor security camera system nowadays. But be sure to get the one with manufacturer customized app, like Reolink app, to save your trouble in installation and configuration for remote viewing. Those outdoor security camera system with default apps usually don’t require the IP address, port number to finish the complex port forwarding for remote access. 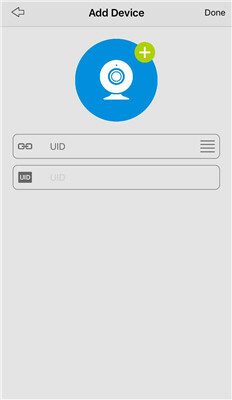 Simply enter the UID and password, the P2P technology can get you to the camera live view easily and safely. If you are planning on a do-it-yourself project, the best choice is absolutely the truly wire-free outdoor security camera system. Anyone can finish the whole setup without having to pay the expensive installation fee additionally and spend hours installing the system in the hot weather. 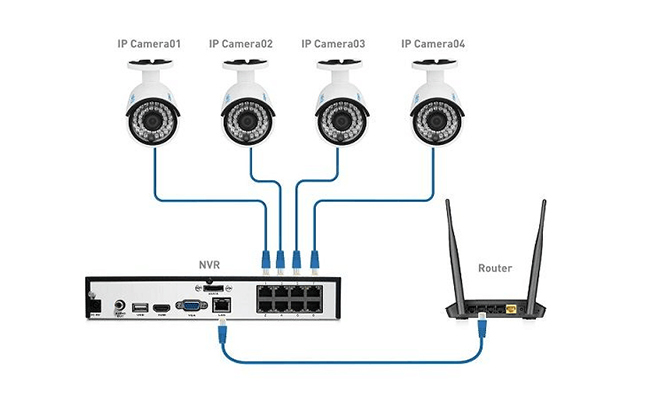 Another good choice is the wireless or PoE outdoor security camera system, a flexible single cable system that records to the NVR (network video recorder) locally. Usually the NVR security system has at least 1TB storage for long term recording, which is the biggest benefit of it. Having weather outside? No worries. Any IP66 rated outdoor security camera system can easily deal with that. Simply put, IP66 means waterproof, and no natural elements can get into the enclosure as long as you don’t put it under water. Actually, the outdoor security camera systems are quite affordable these days, and even the quality ones could cost you under $500 (for like 4 high definition cameras and a 2TB NVR) if you choose the right brand. And there are many choices that don’t force you to the monthly fees of cloud storage or third-party monitoring. If you are one of those who prefers the one-time cost, you may take a look at Reolink cameras. Bonus: Continue to read this post to learn some insider tips to save money for outdoor security camera systems. Brilliant idea! Wide angle camera is a great way to save your budget for outdoor security camera systems. For example, the wide angle 4 camera system RLK8-410B4 could cover more areas than many higher priced 6 camera security camera systems. If you want more, like the panoramic view, then add a PTZ security camera to your outdoor security camera system, so you can control the camera to pan and tilt to any angle you want. Outdoor security camera system night vision is a great feature for not only office monitoring but also home surveillance. And IR night vision is the most common and reliable way to go for most outdoor CCTV camera system in the market. You will never know what is going on outside your house and what you are gonna lose tomorrow, unless you have the wireless outdoor security camera system with night vision in place to keep an eye for you. Want color night vision instead of black and white? The battery powered camera like Reolink Argus 2 could get you there. But that’s not necessarily always a better option, you know, all cameras will automatically turn to black and white night vision for the best clarity in very poor light conditions. It’s a BIG BIG headache to install the security camera system. But you can take it easy if your security camera system are PoE enabled or wireless, or better still, wire-free, like the three outdoor CCTV systems mentioned above. Simply follow the steps in the video to set up your outdoor security camera easily and quickly. Here I use the outdoor security camera system Reolink RLK8-410B4 as an example. Other systems should work in a similar way. Read the following tips to gain more insider tips about the wired and WiFi outdoor security camera system and become a real pro in it. Make a list like this and you will know exactly how many security cameras you will need. And generally, an 8 channel outdoor security camera system is perfectly adequate for home. Bonus: Read this post for more detailed information about how many security cameras you need for home and business. Bonus: Read this for more insights on where to place your outdoor security camera system. The wireless security camera system (outdoors and indoors) are very popular among users because of its easy setup. Choose the wireless security camera system with dual band WiFi for stronger network signals. Avoid physical barriers and position your wireless router right to avoid WiFi interference (Click here to check the best router positioning). Bonus: Continue to read the top 8 tips to fix the WiFi security camera system not working issues. The wired outdoor security camera systems are NOT the opposite of the wireless ones, and they can be easy to set up with PoE technology. And they are usually higher resolution capable (like the class-leading 4MP. 5MP even 4K) with less burden to your home network. 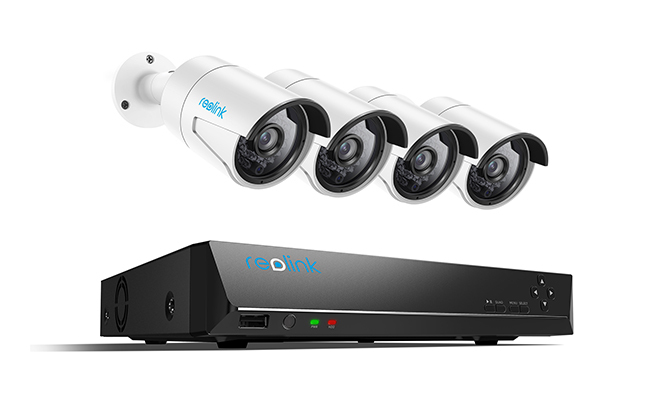 Many wired security camera systems could support up to 16 cameras within a system, like the Reolink RLK16-410B8. So if you want higher resolution and plan to expand the project to 6 or more cameras, a wired outdoor security camera system with NVR (instead of DVR) might suit you better. Bonus: Find more insider tips about wired security camera systems here. And read this post for more insights about which one to choose, the outdoor security camera system with DVR or NVR. This entry was posted in Buyer's Guide and tagged installation, outdoor security systems, reviews, top picks.